1.0 Scope - includes a reference that the standard includes ISO90018 requirements. 2.0 Normative References - Same. 3.0 Terms & Definitions - Additional definitions are included with the AS9100 standard. 4.0 Quality Management System - Reference to statutory and regulatory requirements. 4.2.1 General - Organization's personnel are aware & have access to QMS documentation & changes. 4.2.4 Control of Records - Additional reference to suppliers. 5.2 Customer Focus - Additional reference to on-time delivery. At United Seal and Rubber, we work with many of the top primes in the aerospace – military markets. We take pride in our commitment to deliver quality product to the companies in this industry. However, we do take the same pride and follow the same quality processes when working with our customer outside of the aerospace – military industry. So whether our customer is aerospace or general industrial, we have the same quality focus for both. An additional benefit of working with a company like United Seal & Rubber Company is the suppliers that we have aligned ourselves with are quality focused as well. Names like Parker Seal (recently changed to Parker Engineered Material Group), Parker Chomerics and other recognizable brands in the industry. Just like United Seal & Rubber, many of our suppliers Quality Management Systems are also ISO9001 and AS9100 certified. In addition to those two certification, we work with suppliers who’s Quality Management Systems have TS16949 certification. This creates a win-win situation for our customers and provides additional piece of mind. Finally, not only do we have systems in place to continuously improve our processes but we are focused on other areas of improvement. Recently, we adopted a 5S program that has help everyone sort, set in order, shine, standardize and sustain their work areas. Everyone from our machine operators to our office personnel practiced the 5S and have taken great pride in the principles of 5S. Again, it goes back to quality is everyone’s job. 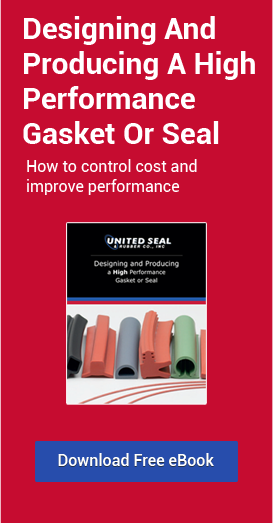 In closing, if you are looking for a quality gasket and/or seal supplier, give us a try.